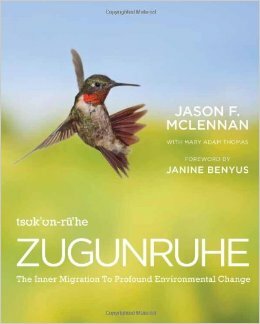 Book Review: "Zugunruhe: The Inner Migration To Profound Environmental Change"
Zugunruhe, by Jason F. McLennan is about the need for humans to make an inner migration in order to save the environment. It relies on the statement that the environment is in grave danger, and that for our children’s futures to be secure, we must change the way that we impact the world’s climate. Mclennan does a wonderful job instilling the desire to bring about change in his book. The surface of the book is about saving the environment, but once one cracks the ice, she realizes that in order to change the environment, it is necessary to first change herself. The book acts as a guide, outlining the path to change. A single reading is not enough to fully grasp the information that McLennan has presented. He envisions a better future in which we all work together to bring about change, starting with ourselves, and I want to be part of it. I will use the information from this book in my life, whether I am fighting for environmental justice, or fighting to further my ability to make a positive and productive influence on my friends and family. Although most of the book really struck a chord with me there were certain parts of it that I feel could use revision. The author is an architect, and a good number of pages are devoted to green building. While this is a just environmental cause, it is not as stimulating to readers who are not as interested in architecture. The main focus of the book should be to teach people how to make the inner migration to environmental change, and the addition of green building does not help people complete their journey. My second issue was that McLennan, like many environmentalists, seems to believe that he is somehow superior to those who are less environmentally responsible. This took form in his tendency to boast about his personal successes in green building. Despite this criticism, I still recommend Zugunruhe. The book will make you rethink the way that you are living your life.